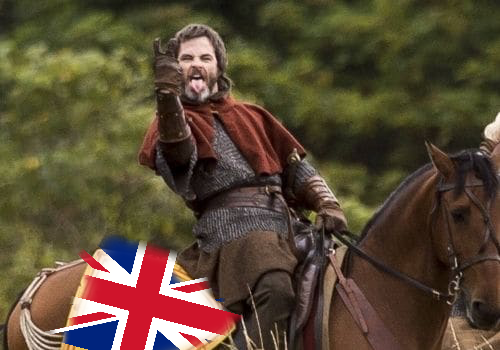 With Netflix’s Outlaw King released and Hollywood heart-throb Chris Pine filling out the chain-mail as spider bothering Scottish Monarch Robert the Bruce, Unionists all across North Britain are scrambling to ensure that it doesn’t inspire any uptick in separatist feeling among internet streaming Scots. When Braveheart was launched in 1995 and was a big hit some claimed it inspired Scottish nationalist feeling that led to the subsequent setting up of the Scottish Parliament. Despite being one of the most successful and enduring Oscar winning films of all time, since release Unionists have worked over time to discredit the Mel Gibson opus because the enduring and precious Union of these Islands is that strong that a 23 year old film still threatens its fabric on a daily basis. So what new challenges to the World’s most successful political union does Outlaw King present? So if you’re proudly Scottish but fiercely British, make sure to remind your SNP loving Nat neighbours of the following when they tell you you should watch the latest propaganda film and you’ll enjoy it much more. Woad, the length of the kilts, the fact that the soundtrack sounded a bit Irish, and not the good type of Irish. All these things count against Braveheart. So what can we count on in Netflix’s badly researched and flawed film? Well for one thing, we know that the Bruce didn’t even look like Captain Kirk, because even the Original Series with William Shatner hadn’t aired at the time of the events of Bannockburn. Remind the misguided seperatist that Hollywood never fabricates or moves around events for dramatic effect. That’s for the Reporting Scotland to do. The Bruce wasn’t even Scottish. He spoke Gaelic and French. A Teuchter and a European? Sounds like the type of guy who would spend £26 million on Road-signs literally no one can read and try and give workers statutory employment rights and straight bananas which affect your ability to trade with the rest of the World to us! Chris Pine seems like too nice a guy, but hopefully like Mel Gibson he’ll end up falling into alcoholism and being accused of sexist and anti-semitic behaviour that would make even a Unionist councillor blush! Film totally discredited as a piece of art and entertainment. Hope that Mary Queen of Scots shows how daft it is for Scotland to be ruled by a woman who isn’t Ruth Davidson. Look on the brightside of Brexit Britain and have a Brucexit. Outlaw King only has 57% on Rotten Tomatoes, but we can’t take anything for granted. We might have to put all our gammon on the one ham sandwich.